Within this page a few essential mountain climbing equipment items are described. Those include rucksack, shoes, helmet, walking poles, and a few others. I have already pointed out elsewhere in this site that investing a lot in the equipment is not the best way to start mountain climbing. In time you will surely develop your need for the appropriate equipment, and its amount will increase. The poles provide an essential stability when walking over a rough terrain or when crossing water-streams. I believe they partly reduce effective weight felt by my bad knees. My friend Mitsuo resting with the help of poles. It is important to have retractable poles so that you attach them on your backpack when you are in some rock scramble. They come sometimes with compass and more frequently with and anti-shock mechanism (which in fact increases the weight). Many of the poles are described in this site, you can read about them here. Rucksacks (backpacks) are categorized by volume in liters and sometimes in cubic inches. I use a Deuter of 38 liters which I bought in 2003, it was expensive, and it is still in perfect condition after many climbs. I do not think I shall need another one anytime soon, see it in the picture below. It satisfies all what I need for daily tours and to some extent also for an overnight stay when I carry a tent and a sleeping bag. I have a bigger one, of 60 liters, which I rarely use, as well as one of 25 liters. Many necessary things are kept in the pockets of my Deuter, and I hate getting all this out and putting into the smaller one for short tours. Besides, I tend to carry too many things, just to be ready in case of trouble, so my perfect formula is 38 L.
Some elements of my standard equipment. 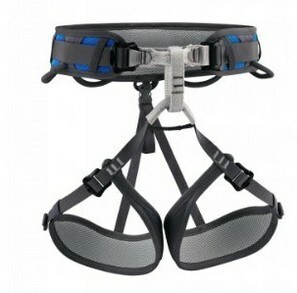 It is absolutely essential that you have a proper size regarding the harness. This because most of the rucksack weight should be on your hips, otherwise you will not be able to carry it and breath normally. Some models allow you to adjust the harness on the fly, just have a look into this text about Kelty Redwing 50 liters backpack. Load-lifter straps (see the picture) should be properly adjusted. When they are loose, the rucksack will lean backward too much, and you will have a balance problem. The best is to try it, and you will find the most suitable position for you. There are also sternum straps on the chest; these should not be too tight to avoid pressure on your chest, but they are necessary for the stability of the rucksack. Normally, in packing your rucksack, heavier stuff should be on the bottom in the main compartment, but not below your heap-belts. Lighter stuff I usually carry in the so-called sleeping bag compartment, which is in the lower part of the rucksack, below the main compartment. I have a separate text addressing this issue. The majority of rucksacks nowadays come with a rain cover, which is usually in the pocket completely below. But in any case, check it when you go to buy one. If this is about going to mountains I would not consider a pack without a rain cover. 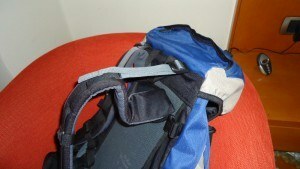 The rain cover is attached to the rucksack with a piece of strap, otherwise the wind could blow it away. many backpacks are reviewed in the site, have a look here. Inside the rucksack, I always carry waterproof pants, extra fleece, waterproof gloves, and a waterproof jacket, so these are standard elements of equipment. You can read more about this in my separate text. This was an investment for me, but just like with the rucksack, I bought my Meindl shoes long ago, in 2007, and they are far from being worn out, see the picture below. Those are shoes with a rigid sole, so called hybrid-type with respect to crampons. This means they have welts on the heel only and not on the toe. So my crampons have a toe strap to hold them in place on the toe (hybrid-type crampons). For such stiff boots you will need many kilometers to walk (and to suffer) before an adequate break-in and fit. I suffered a lot with blisters in the beginning. My hybrid-type, after 7 years of wear and tear. 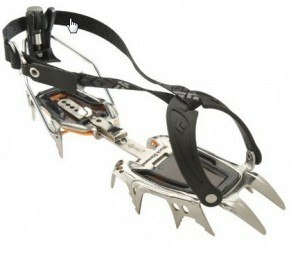 Those like mine thus are for hybrid crampons, perfect for glacier walking and even for some more serious glacier climb. Boots with welted both heel and toe are for so-called step-in crampons. 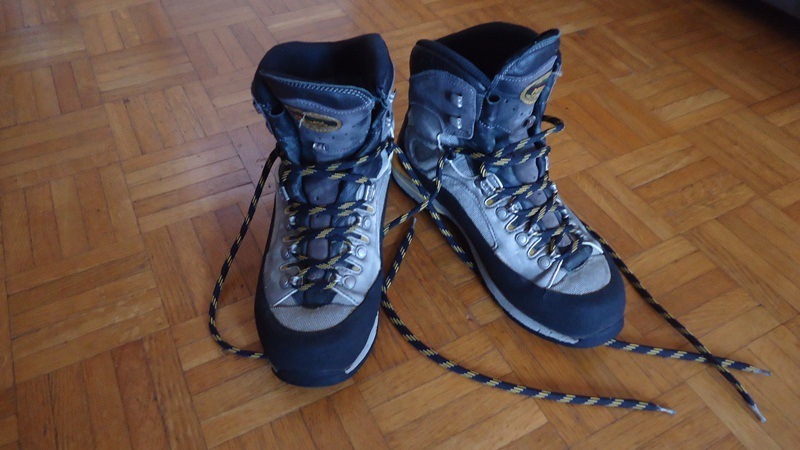 Boots without welts can still be used with strap-on crampons, and they are good enough for any glacier walk. Of course, strap-on crampons can be used with any of the three types of shoes mentioned here. Much more about boots you can read here. step-in: for a stiff sole, for the most technical climbs; a wire holds the toe and a a cable with tension mechanism holds it to the heel. strap-on: nylon webbing around the shoe, appropriate for any shoes, for less technical activity. hybrid: mixed, step-in system back, and strap-on-webbing on the front; for stiff-sole shoes. aluminum crampons: for less demanding glacier walks, not durable, better not spending money on this. My crampons are steel, so they corrode. To prevent it, I clean them and lubricate slightly with some oil at the end of a season, and keep in a special bag for crampons. You can see them in the first picture above. flexible; good enough for simple snow/ice walking. 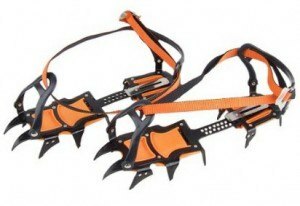 crampons with 14 points or more; semi-rigid, rigid, hybrid. My are steel crampons, 12 points, hybrid. They are a bit heavy part of equipment, but I feel very safe with them. Have to sharpen them from time to time. More about Petzl crampons which I use you can read in another post within the site. I am using this Petzl Elios helmet, it is very light and good. This was also an investment but it will be a part of my equipment for many years. Most of the helmets available on the market are described here. 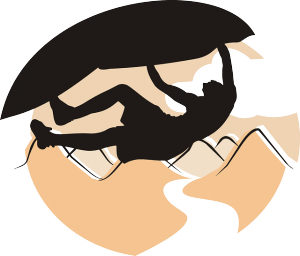 A nice description of this tool and the ways of using it can be found here on Wikipedia. 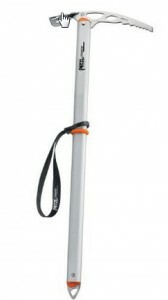 It is very helpful to have it for an uphill walk, though for such a purpose more frequently I am using trekking poles. But an axe has many other possible purposes. You never know when you might need it, so I carry it almost always attached to my rucksack (see the picture in the beginning of the text above). I am using a Petzl axe, the same as the one on the picture, but there are quite a few brands available on the market. They come in several sizes; in some occasions in Switzerland I have seen really huge ones, with long picks and adzes. It is essential to have the corresponding leash in your equipment, which is a loop for securing the axe to your hand. 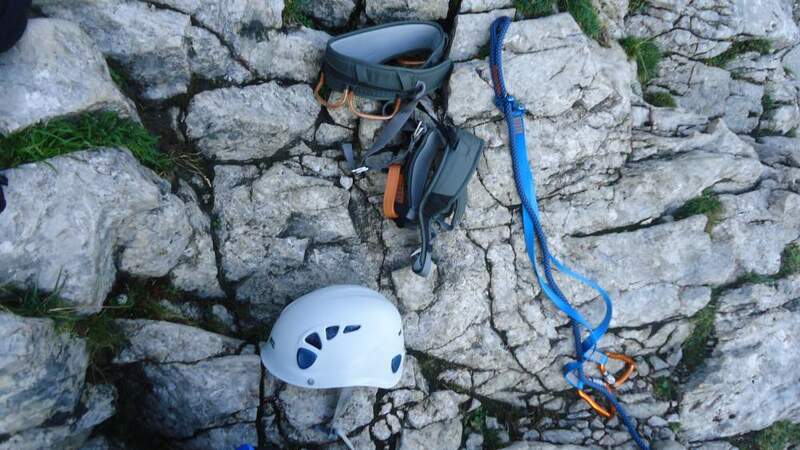 This item you will use if you go for ferrata routes (iron road in English, klettersteig in Gereman), for glacier walking with rope, or for vertical rock/wall climbing. This is a rather light part of the equipment. 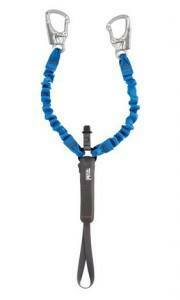 For ferrata routes you will need a V-rope in combination with the harness. This part of equipment has two carabiners. You will use it on a ferrata route in such a way that at every moment at least one carabiner is always attached to the cable. The other side of the lanyard (the loop on the bottom in the picture) is attached to the front side of your harness. 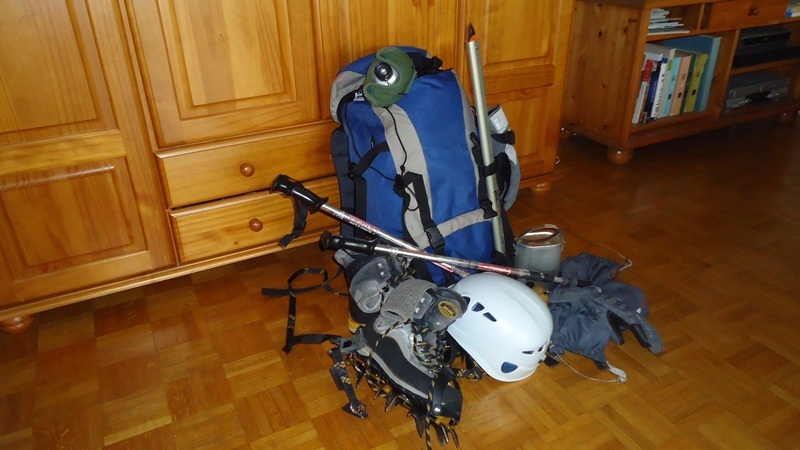 Here below is a photo from my last summer while climbing Alpspitze where I was using some of this equipment. Some elements of my equipment used climbing Alpspitze in German Alps. The list of items for mountain climbing equipment presented here is far from complete, this page is only about some very basic elements which you may need. All these items and many more you may find in my separate page with equipment reviews. I hope this page has been useful to you. If this is so please share it with others. Please leave your comments below, I shall be happy to read them. Be safe when you go to mountains. Do not go to ‘conquer’, go to enjoy their eternal beauty, and remember they are stronger than you. Have a nice day. Great very clear article, thank you. My wife and I are planning to do a long distance walk, mostly the GR58, with some detours, in July. I’m assuming your advice re boots etc. is valid. Do you ever use Nordic walking rather than trekking poles? If so would your boot recommendation still be the same! Hi Michael. Thank you for the comment. I have not used the poles for Nordic walking, but I do not see any big difference. The role of the trekking poles is to give you stability on a rough terrain, so the Nordic poles will do the job. Not sure what you are asking about the boots. 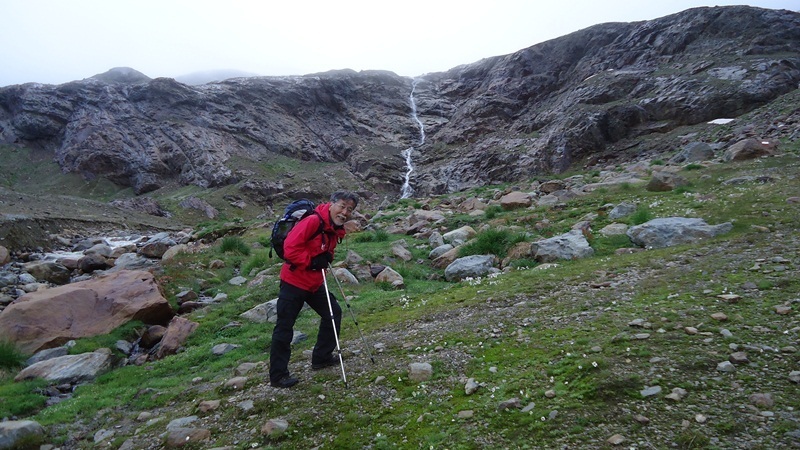 I did not pass the GR58, as I understand it is below 3000 meters all the time so you do not cross glaciers. If so, then do not use boots with stiff soles. Have ordinary hiking boots (not shoes) with a good ankle support if you carry a heavy pack, there are many described in my page with boots. Let me know if you need more details. Make sure that you break the boots properly before the trip, this may mean walking at least 100 km, but this will depend on the materials of course. I will use your description to do the Lagginhorn this summer. What do you do that your shoes still look this good after seven years? I am already at the end of my third or fourth pair within 10 years and >1500km trekking – but that shouldn’t really matter for anything but the soles? I grew out of the first, bought the second pair on the trek – never a blister, god bless 😉 ; then the others started to loose their grip (soles were flat) and their waterproof ability, though I did impregnate them from time to time. The last pair also has “fabric hooks” for the shoelaces instead of metal, like yours. One of these broke a couple of weeks ago) They were good shoes, as they were sturdy, stable and never gave me blisters. Still, the replacement rate is somewhat annoying. I will try your shoes when looking for new ones now. Hopefully they fit. Do you have any recommendations for maintenance? And do you have the soles replaced, once they are walked off? Hi Carmen, so great to hear from you. So Lagginhorn is your next on the list. I hope you will have better weather and I am sure you will enjoy it. In fact the boots you are asking about I was using for the first time that summer when I climbed Lagginhorn. That was a successful season for me, several times over 4000 meters. From this you realize how old they are. I only hope that new models of the same brand are of the same quality. I can tell you I do nothing, just clean them at the end of season and keep till the next one. But I did have a lot of blisters, those are very hard boots with stiff soles. Never did any replacement. They are old and I cannot find them on Amazon, otherwise I would happily promote them in my site. As for the pack, it is strange than anybody recommended to carry heavy stuff on the top. This is totally wrong. I am now speaking as a physicist, this is my profession. The best is to carry heavy stuff close to your center of weight and balance. If this is not so, then your distribution of weight is far from perfect and you are unstable. This means: a) just above the waist line (so that the weight is transferred to the hip belt, and, b) as close to the body as possible (i.e., close to your center of gravity body). For example, if you have internal sleeve and do not use it for water bladder, then this is the ideal place for crampons and other heavy stuff because this is the closest to the body. In the end, try it and listen to your body, it will tell you what the best for you is. Best luck on Lagginhorn, I hope I shall be in the Alps somewhere in August. All the best to you. How much money would I have to set aside to get started. My wife and I are both interested on going on a hike. Can we start out simple or would we be walking into a miserable trip. We were both inspired by the movie “Wild” and now we want to go. Any info would be greatly appreciated. Good read! Hi Bret, I always like to say that you do not invest in mountain climbing equipment unless you are completely sure that this is for you. Try it first in some easy tour to test how you feel about it. In any case, you can consult my page with equipment reviews. I am quite confident without these essential items would make hiking a lot more tougher than without these core products. I admire your web presence and is a interesting niche to be into. Do you also use these types of equipment when you adventure the wilderness? Nice to hear from personal experience. Hi Benjamin, thank you for visiting my site and for the comment. Regarding your question, yes I use all the stuff described in this particular page. Some of the photos you see in the the page show my own stuff. You may read my latest text Climb Alpspitze, where I used some of it. Note that I do not use the word hiking for trips which involve such equipment, this is climbing. Man, I miss the mountains so much. Thank you for reminding me that they exists, it is time to visit them. Actually I never really tried climbing mountain with a big equipment, but after reading your post, I am actually considering to give it a try, to get even higher. Let see. If my plans are becoming real, I will come back to you and check your website for further information about equipment and preparation!! Keep going, like the way you present your content! Hi David, surely you should try but do not invest too much. Try it first and see if this is for you. Going light, with a small backpack and light hiking shoes is an advantage, I just did it today and climbed Kreuzspitze in Austrian Alps. I was really fast, in 4 hours from Vent village. I read your article about Mountain Climbing Equipment. Your article is very clear and detailed. You have clearly explained about each and every equipment the user needs before his mountain climbing expedition. This is something I really like. The pictures that you have chosen is mentally captivating. Overall you inspire the reader with good information. Thank you Shivaram, great to read your comment. It makes me happy that you find my page useful. Another great post Jovo. Equipment is so important when planning a hike. I have actually never used the poles, as I didn’t think they were necessary, but now I realize that I just didn’t understand their uses. Next time i set off on a hike, i will be sure to buy a pair. Hi Todd, great to read your comment. Waking poles are an essential part of my equipment. I do not go to a mountain without them. Thank you for visiting my site. Wow you have a really fun, opening home page with that song. It really gives you a sense of joy! There is a lot of information on mountain climbing and I can really see myself climbing now. I had a look at the products you sell and they are top quality which is a good. Keep up the good work, your doing a great job! Hi Josh, thank you. Great that you like my choice of music. As for the text, I hope it will be of some help. Best luck if you go to mountains. This is a very well organized site. I really like the fact that it is so personal and only about the places you have actually visited. It is also great that the photos are all yours too. I try to take many of my own photos as well and use them however some are not my own. You have traveled so much. It is nice for you to share those experiences. The places you traveled are well explained when clicking on them as they take you to wikipedia and explain about them which is very helpful. Kind words Mick, great to read such a comment. Many thanks. Hi Lorren, thank you for stopping by. If you are in the Alps then you are safe from animals. There are no wolfs or bears there, perhaps only occasionally if they come from somewhere else. But in some other mountains surely one must be ready for such unpleasant surprises. Ice axe is a great tool and it can come good even for such cases. My interest was held throughout. You did a very good job explaining the various elements to climbing. I had no idea there was so much to it! I really enjoyed your pictures and the way they opened up in a lightbox sort of gallery. You did a great job of placing them as well. I will definitely have to look into some of this stuff. I really enjoy camping and lately my friends and I have been talking about backpacking.. Would some of this equipment work for hiking regular mountainous terrain? Would you recommend it? Hi Stu, thank you for visiting my site. Regarding your question, I would warmly recommend using walking poles. This is such a useful part of equipment. I do not go without them anywhere. I must say, you have an awesome site and with very lovely pictures. What you say is very true, it is not good to invest in all the gears. Now I know what are the main equipments I would need when I go mountain climbing. You have highlighted the individual equipment purposes in a very clear manner, it was easy to understand. Though I am not going mountain climbing any soon, this might come in handy in the future. Hi Kumar, thank you for visiting my site. Not going to mountains soon? Pity, you miss a lot. You look like a man in love with mountains, I have seen your many images at different location, Thanks for sharing the necessary tools, I have not been to steep slopes till now, but I wish to climb Mt.Everest one day, till some peak if not to the top, since it’s near from my place. I love outdoor excercise like climbing, riding bike(bicycle), and walking or jogging on mountains. Hi Kunal, Everest near your place! That must be a place. Thank you for visiting my site and for the comment. To me, the walking pole is your best friend when out there. Once you start using one you wonder how in the world you ever managed without one! Correct boots that fit right are right there with the poles. A poor fitting pair of boots will make your trek miserable. I agree, add equiptment as you need it, thus your amount will grow gradually, depending on how much you climb. Hi Shawn, I totally agree about the poles. I make no step without them. Indeed, no need to invest in the beginning. You will develop your needs in time and in the same way your equipment will grow. Thank you for the comment. Hi Sarah, thank you for the comment. I felt same way about walking poles when I started using them. But now I am not going without them ever. This is a part of equipment I always have with me.